With the summer months and PGA tours around the proverbial bend, men everywhere will soon begin to embrace polo shirts. These short-sleeved, cotton shirts could easily be called golf shirts or tennis shirts, since they are used in all 3 sports, but, for the sake of clarity, I will refer to them as polo shirts. For those of you who are interested, Rene Lacoste, the French 7-time Grand Slam Tennis Champion who was nicknamed "the Crocodile", is credited with designing the first version of the shirt. It was short-sleeved, made from a pique cotton (pique refers to the type of weaving used and makes the shirt more "breathable") and had a longer shirt tail in the back to prevent the shirt from coming out of his tennis shorts as he bounded up and down the courts (feel free to read more about it here). Eventually, Lacoste would turn his stylish design ideas into an apparel company in 1933. And thus was born Lacoste. 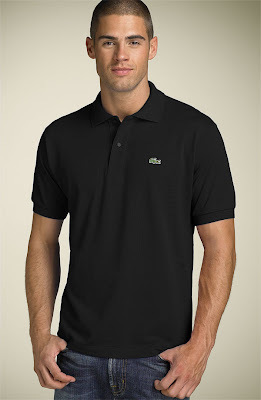 As it turns out, Lacoste makes my favorite polo shirt and the one I tend to buy season after season. Why Lacoste? Their recent versions of the polo shirt come with a trimmer cut, slimmer sleeves, and without a ridiculous shirt tail. What does this all translate into? A shirt that fits better than most, won't make you look like you're swimming in a sea of cotton and looks great both tucked into your flat-front khakis or un-tucked with your jeans. And, just in case you're a visual learner, here's an illustration; try your best to look like the guy on the left (Camillo Villegas) and not the guy on the right (Vijay Singh). Even better, here's a video from the guys at GQ with step-by-step instructions on how to upgrade your golf style completely, with specific tips on slimmer cut polo shirts. What about for our heavy friends....what style alternative should they choose?